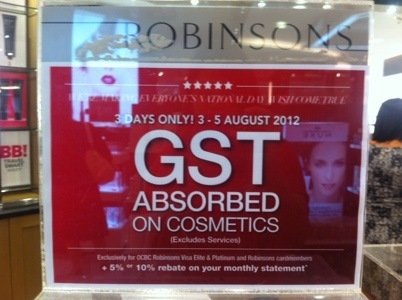 Robinsons is having a promotion where gst is absorbed for the weekend. This is only applicable for cosmetics. So basically, your savings with the robinson card is 7% gst plus the 5% regular rebate. They are also having another promotion. I think its 20% of shoes and 10% rebate instead of the usual 5%. 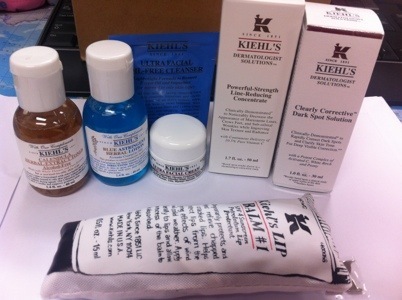 I have heard a lot of good reviews on the Kiehl’s clearly corrective dark spot solution. This is a 30ml gel like concentrate that helps to even out skin tone and ligten up any dark spots that could be from acne scarring etc. It comes in a glass bottle with a dropper. You need about 3 drops to cover your face and probably 2 more for your neck. I am being generous here so you might use lesser 🙂 this rrp for SGD 90. 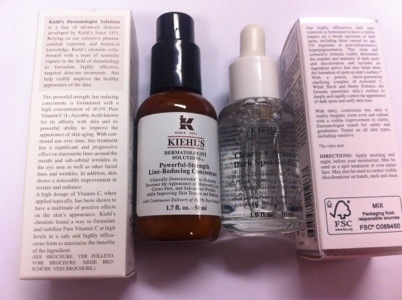 The other one that goes hand in hand with the above is the powerful strength line reducing concentrate. This rrp for sgd 132 and for a 50 ml bottle, I think its pretty worth it. It’s a creamy texture like most moisturizers. However, it is not very thick. Given that it’s a bit more liquidy it is absorbed into the skin without much effort. This comes in a pump bottle and it boasts 10.5% pure vitamin c to help reduce lines and boost radiance in the face and neck. 1. the above promo is SGD 222. for this weekend, they give out extra travel size freebies. Such as cleanser, toner, lotion and cream. 2. $120 nett spent entitles you to become their member and you get the regular perks. Product launches, etc. also as a member u get $50 voucher once you hit $500 every 12 mths. What I like about this program is that you only need your mobile number. No cards, no paper vouchers! Yippie! 3. eventhough the gst promo makes my total bill SGD 207.48, the amount captured in my member program is SGD 222. 4. with the 5% rebate from robinsons credit card, my total bill is SGD 197.11. so that’s a total saving of about SGD 25.